Our inaugural Winter Season CSA box arrived this week, and more than a couple Pennsauken picker-uppers were perplexed by the small bag of sunchokes in the shares. “Wow, that’s a lot of ginger!” Nope. Those are sunchokes. Also called Jerusalem Artichokes, not because they came from Jerusalem (they’re native to North America), but through a linguistic bastardization of the Italian for sunflower, girasole (“jeer-ah-SO-lay”), these tasty tubers are the underground part of a species of helianthus. Raw, they have a snappy texture and a neutral flavor—a bit like jicama or water chestnuts, with some of the earthiness of kohlrabi. Cooked, though, they do, in fact, taste like artichokes. I knew this only thanks to the generosity of my pal Dale, who’s grown them for years—and who shares giant bags of them when he pitchforks them up each season. 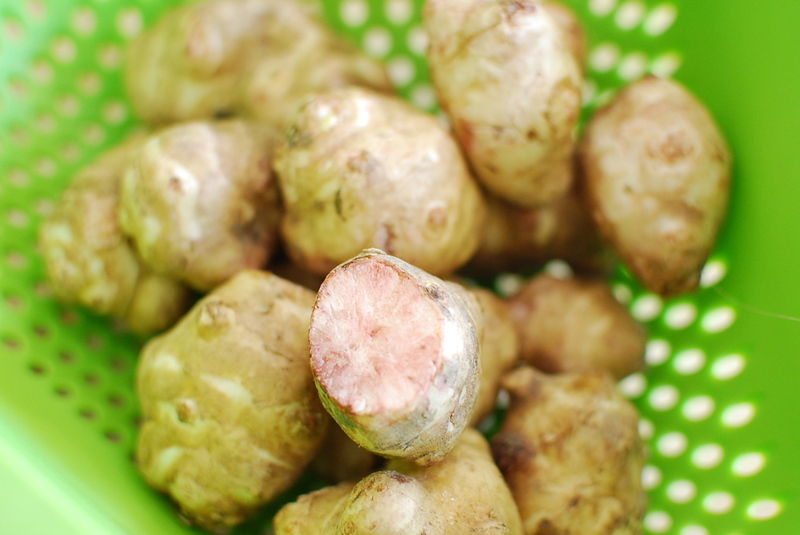 Sunchokes have lots of GI benefits—but until you know how your gut will react, it’s best to start small. I also knew, from Dale, that you need to be a little careful with these nuggets. 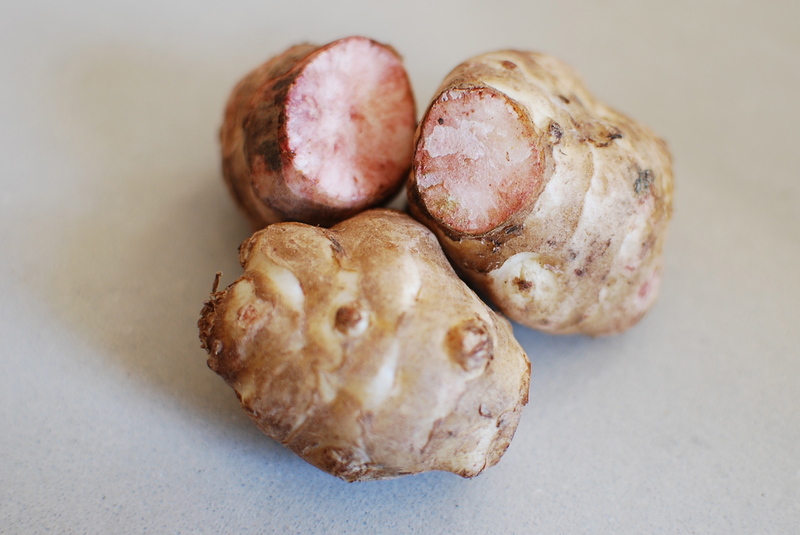 They’re rich in iron, low in starch, and packed full of a long-chain fructose (inulin) with a variety of gastrointestinal benefits. They affect everyone’s gut a little differently, though (there’s a reason the Brits call them “fartichokes”), so until you know your own tolerance, it’s best to start small. Make them a side dish—or mix them in with other roots (say, roasted and/or mashed with carrots, parsnips, and potatoes). Or try this simple soup. Peeling and cooking greatly reduces the root’s deleterious effects. 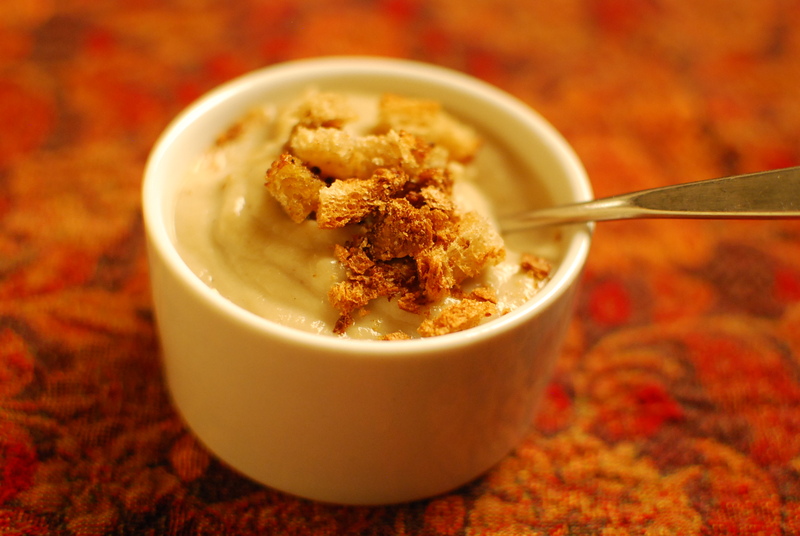 Plus, the soup itself is wonderfully opulent and nutty, so a small portion as a first course is perfect. Make it vegan with vegetable stock and almond milk, or amp it up even further with a rich chicken stock and a splash of cream. Makes four small portions or two larger ones. My sharebox contained just over a pound of ‘chokes. Peeled, they amounted to about 2-1/2 cups. 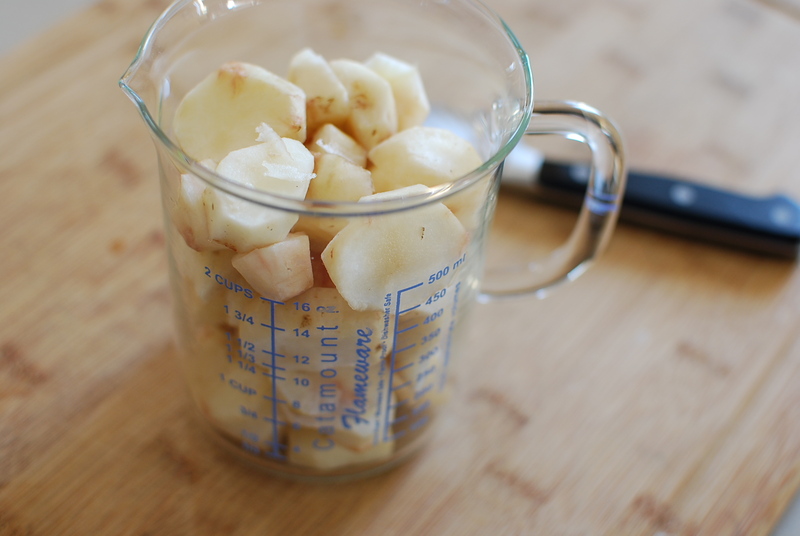 In a large bowl, toss the sunchokes, shallots, and garlic together with just enough olive oil to coat. Sprinkle with salt and pepper. Spread it all on a foil- or Silpat-lined baking sheet and roast for 20-35 minutes, until the ‘chokes are golden and soft. Move the roasted roots (shallots and garlic included) from the roasting pan to a small stockpot. Cover with the stock. Bring to a simmer. Let it go for 10 minutes or so. Purée until very smooth, using an immersion or upright blender (carefully venting the steam). Return to the pot. Add the almond milk or cream. Taste, adjust the seasoning, and reheat through. Garnish with a little something crunchy—croutons, or crisped olives or ham. I wanted a little texture on top, so I tore up a rye-bread heel and toasted it in a little olive oil. Instead of croutons, some crisped-up prociutto strips or pancetta cubes—or diced black olives—would also be pretty fantastic.